Fruit bearing trees flourish in Portland, Oregon and there are many varieties that have been planted over the years. To bring out the best in fruit production and ease of harvest requires pruning with the goal of producing the proper structural form for fruit bearing. While very intensive “orchard-style” pruning techniques may bring about the goals of production, we often find the need to balance our desire for mere fruit production against our desire to have a beautiful tree specimen as well. A well thought out approach is needed. 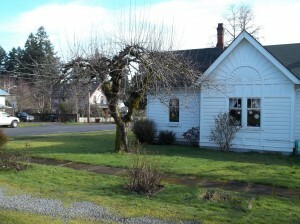 A very common tree–the apple tree–presents a difficult problem. 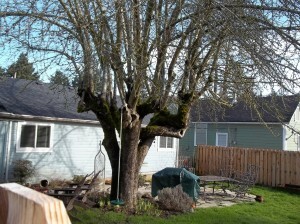 Is it a fruit tree or is it a shade tree? How should it be pruned? Apples that were once maintained as fruit trees will, if let go, produce long vertical suckers that become whole stems. These stems are often very difficult to reduce and yet retain a pleasing shape to the tree.